Adventures with Law Enforcement and Service Dogs – ComeHereBoy! So I unfortunately had my first misunderstanding with a police officer this week with a service dog in training. 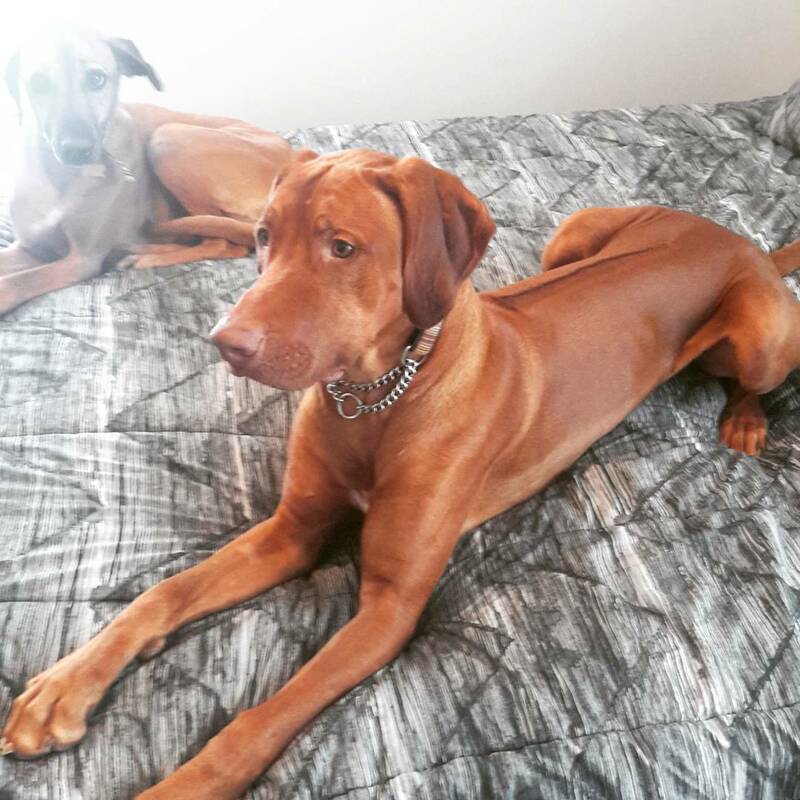 Rudi, this handsome Rhodesian Ridgeback, is a rescue that I am fostering for a family with a boy with autism. He has a gentle, sweet temperament, and only lacks the training to make a wonderful service dog. He’s about 90 lbs, very intimidating looking, but not a mean bone in his body. I will be his trainer and I’ll be training him to help the boy with various issues that he has. He’s going to be such a great help to this boy and his family. I’m really excited to help them out. I’ve been training him while he’s been at my house and he’s been learning very quickly. So anyway, back to the story. Our house is for sale, and so naturally we have people coming to look at it at all hours of the day who don’t want three dogs barking at them. 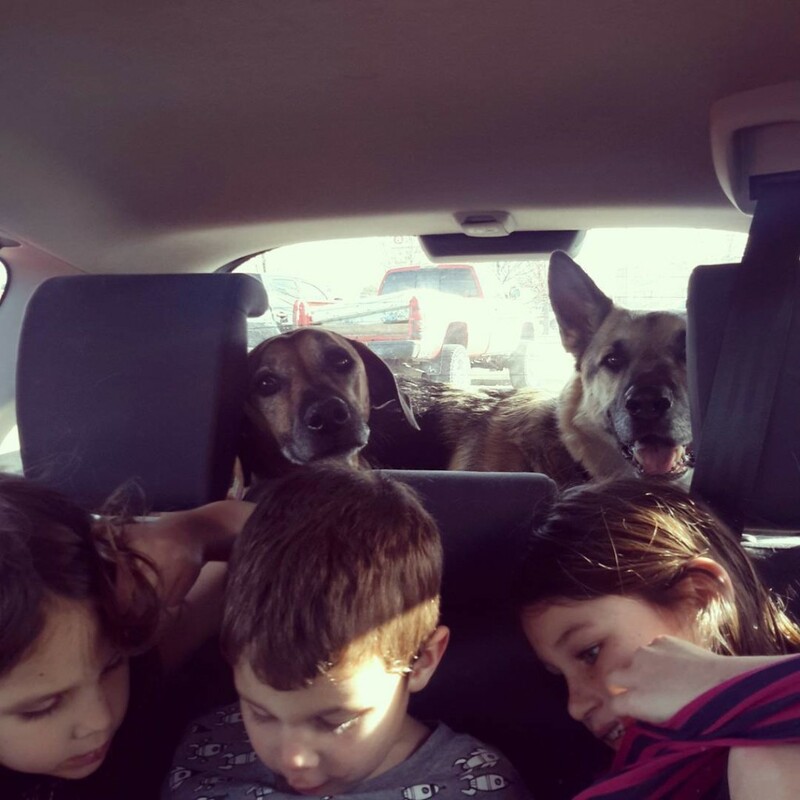 One such showing was happening, so I loaded up all three kids and all three dogs in our tiny black Honda Fit. I thought this would be a good time to practice training Rudi around distractions (especially kids, since he’ll be around lots of them) while my kids played at the park, so we went to the park down the street. I left the other two dogs in the car, as the park was a “NO DOGS” park. According to Utah state law, however, a person who is training a service dog is allowed to be accompanied by said service dog in training to anywhere the public is allowed, which in the law, includes public parks. So I thought I was safe. Rudi and I practiced loose leash walking around the park and he did pretty good. He’s still learning not to pull when he sees a kid nearby. He really, really like kids. We practiced leave it, touch, sit, down. All those fun things. He did great. Then we went and sat on a bench while the kids played some more. And then that someone called the police instead of coming over to ask me why I had a dog in the park. Those people are my favorite. I mean, I’m not gonna lie, I mutter under my breath about people having dogs in the park when they shouldn’t. But before I call the police department, I usually go over and say something to them. I mean, it’s only common courtesy, right? At least the police officer was nice to me. He didn’t haul Rudi off to the pound or anything, but he did tell me that they’d been getting complaints about dogs in the park and could I put the dog in the car? And so I explained my situation and the service dog laws to him. And he basically was like, well, I can’t tell if you’re lying or not, and he’s right. He can’t. But buying a vest, getting a business card and whatnot doesn’t tell him if I’m lying or not either. And those things aren’t required anyway, by law. I’d only had Rudi a couple days, I hadn’t had time to get him a not-required-by-law vest. Well, we back and forthed and he said they weren’t even letting service dogs in the park because of the kids in the park and I was a little upset about that, since that’s very much illegal. And then this nice lady who had quietly come to sit next to me mentioned when he went to chat on his radio that a park and recs person had indeed dismissed her (VERY rudely, with swear words) and her service dog the other day and she was intimidated out of bringing her dog today – even though she needed his help. That’s when I decided not to back down and to make sure that the officer understood the law, because that was not fair. The officer also was under the impression, because of the city attorney, that service dogs were not allowed in food establishments, which is also very not correct (not sure why he mentioned that). I corrected him and asked for his email address and said I’d send him the service dog laws so he could know exactly what they were. He then told me that if I was wrong, I was going to get a ticket. And got my address and all that. Since I’d already made sure to research the laws very thoroughly before I got involved in service dog training, and since I write a blog about service dog training, I nodded and said OK. I wasn’t afraid. I wanted to make sure that he got correct information and that hopefully other officers and the city attorney got correct information as well. By the time the officer left, I had a good crowd of people around me. There were the people that I was pretty sure called on me, who were sitting at the picnic table behind me, hopefully pondering why they hadn’t just asked about the dog, rather than trying to get the girl who was training a service dog for a kid with autism in trouble. There was the nice lady whose son was in my daughter’s class at school who needs a service dog because of her multiple back surgeries who’d been intimidated out of bringing her service dog to the park. There was a mom and her four kids whose little girl could not stop petting Rudi and asking all about him. The mom kept saying “He’s a good dog, isn’t he?” and glaring around the park looking for the offenders who called on the service dog. There was another mom and her partner and their little girl who kept running up to get kisses from Rudi and then would scream and run off and it was adorably hilarious. The mom was also talking to me about him being a service dog and she thought that was pretty neat. I know I was most proud of myself for sticking up for my rights without being rude and also I DIDN’T START CRYING. Usually I break down into tears when I have to talk to people who are confronting me, but luckily the police officer was mostly affable and I knew the law well enough that I knew what to say.It also helped to have Rudi there, I think. There’s something to be said about knowing the law. That said, I guess I could still get a ticket. Good thing it’s not too hard to find a lawyer. after reading this post, I wanted to let you know of something I ordered on Amazon. They’re business size cards that list the basic rules of public access and service dogs; what questions businesses may and may not be asked etc. there are also FAQ’s on the back; what is a service animal? It also names the law, American Disability Act of 1990. Finally, it shows the 800 number of ADA. There is so much information on this card, a lot more than I listed, so the print is tiny but the information is there for people who may not be very informed. 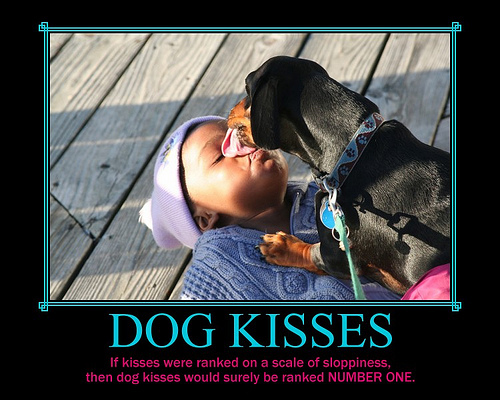 I’ve used it once when a woman question me about the legitimacy of having a small dog as a service dog. I was friendly and polite when I gave the card to her and by the look on her face she still doubted me but it did shut her up and hopefully she took a minute to read the information. Thought maybe this would help! I found it here, http://www.amazon.com/Service-Dog-Cards-Information-anywhere/dp/B006OLNBKU/ref=sr_1_1?ie=UTF8&qid=1460658595&sr=8-1&keywords=Service+dog+cards. If the link doesn’t work just search, “service dog card”. I’ve had employees of 2 different stores harass me about having my service dog in the store without a vest. Both times, I sought out the manager of the store and gave him one of the cards that explains the law regarding service dogs. My cards start out by stating, “If you are receiving this card, you are at risk of being sued for violating the Americans with Disabilities Act.” It goes on to explain the law and that service dogs DO NOT need to wear a vest or have identification. Both times, the manager apologized to me and assured me this would never happen in that store again. And it hasn’t. So, I highly recommend carrying a few of these cards to hand out to offenders. Previous PostPrevious How Do I Get a “Prescription” for a Service Dog?